Editor’s Note: CARLA’s Immersion Projects leaders, Tara Fortune and Diane Tedick, participated in the 2008 Dual Language Researcher Convocation held in Santa Fe, New Mexico in November of 2008. Below they provide a brief introduction for Dr. Jay Parkes’ preliminary report of this first-of-its-kind event. In the spring of 2008 Dual Language Researcher Convocation planning committee members, Jay Parkes (University of New Mexico), Donna Christian (Center for Applied Linguistics - CAL), Kathryn Lindholm-Leary (San Jose University), Elizabeth Howard (University of Connecticut), and David Rogers (Dual Language Education of New Mexico - DLeNM) invited researchers from across the United States to come together in the interest of developing a consensus list of pressing research questions and issues facing the field of dual language and immersion education. Member institutions of the National Dual Language Consortium including CARLA (Center for Advanced Research on Language Acquisition), CAL, DLeNM, 2-way CABE (California Association of Bilingual Education) and the Illinois Resource Center, joined with others to co-sponsor the two-day event. Dual language education researchers from around the U.S. attended this event which preceded Dual Language Education of New Mexico’s annual fall conference, La Cosecha. The researcher convocation began with an evening poster session and the opportunity to socialize and become familiar with participants’ current research interests. The next morning opened with a dual language research review presented by Kathy Lindholm-Leary. Dr. Lindholm-Leary’s review of the literature was followed by break-out sessions dedicated to six pre-identified topics: biliteracy development, political climate, cross-cultural competency, peer interaction, learning disabled and other learner characteristics, and program demographics. During these sessions participants were asked to co-construct research questions that target today’s most pressing issues for the field of dual language education. Nearly 40 dual language education researchers from around the United States met in Santa Fe, NM on November 11-12, 2008, to define the most urgent research questions and issues in dual language education. The group articulated that dual language enrichment programs exist for students of all language backgrounds, not only or primarily for English Language Learners. These programs need to focus not simply on language proficiency but also on appropriate educational and social justice opportunities for all students. The group also recognized the need for advocacy and research for programs from early childhood through high school and on to post-secondary and graduate levels. Dual language teachers and administrators and the academic programs that prepare them constitute a high priority requiring particular attention. Convocation participants recognized the need for a stronger community of dual language education researchers and a more elaborate infrastructure for dual language research. They suggested that the community be strengthened by more collaboration between researchers and practitioners, more interdisciplinary collaboration among researchers, and more opportunities for researchers to come together to share findings and ideas, such as through this convocation. In order to move the research agenda forward, it is necessary to have agreement on essential terminology, and in particular, common definitions for widely used constructs (e.g., the designation of English Language Learner). In addition, it would be useful to develop stronger theoretical frameworks, conduct additional literature reviews and meta-analyses, identify more funding and funding sources for dual language research, and recruit and prepare more dual language researchers. Donna Christian from the Center for Applied Linguistics leads one of the breakout sessions. 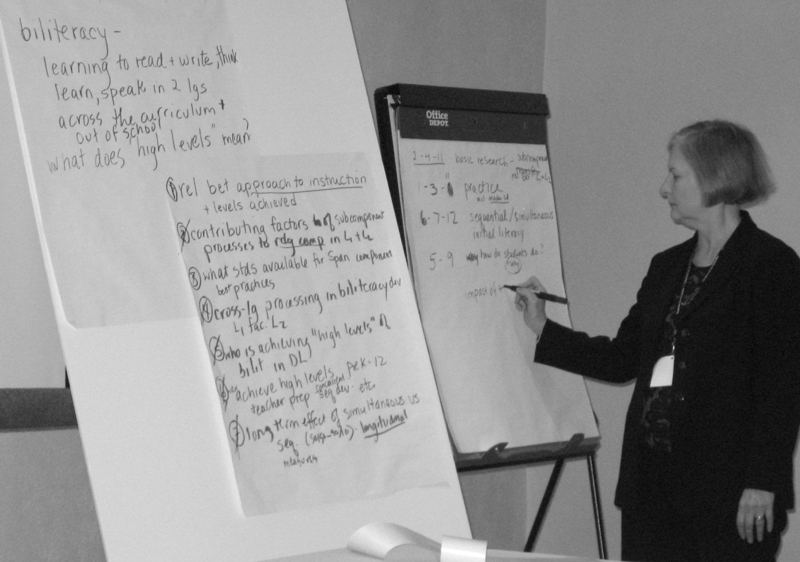 Participants developed and began to prioritize research topics and questions in six broad areas during breakout working groups. Clarification and prioritization of these will continue in the coming months. 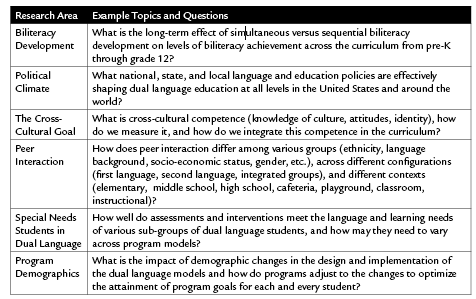 The table below provides some examples of topics and questions from each area. A complete report of the convocation is expected to be released in February, 2009. For updates, check the National Dual Language Consortium website (www.dual-language.org). The event was sponsored by the following organizations (in alphabetical order): Ben Lujan Leadership & Public Policy Institute; California Association for Bilingual Education (2-way CABE); Center for Applied Linguistics; Center for Advanced Research on Language Acquisition; Center for the Education and Study of Diverse Populations; Dual Language Education of New Mexico; Illinois Resource Center; National Network for Early Language Learning ; University of New Mexico College of Education; and Western New Mexico University School of Education.